How long does it take for medication to arrive? 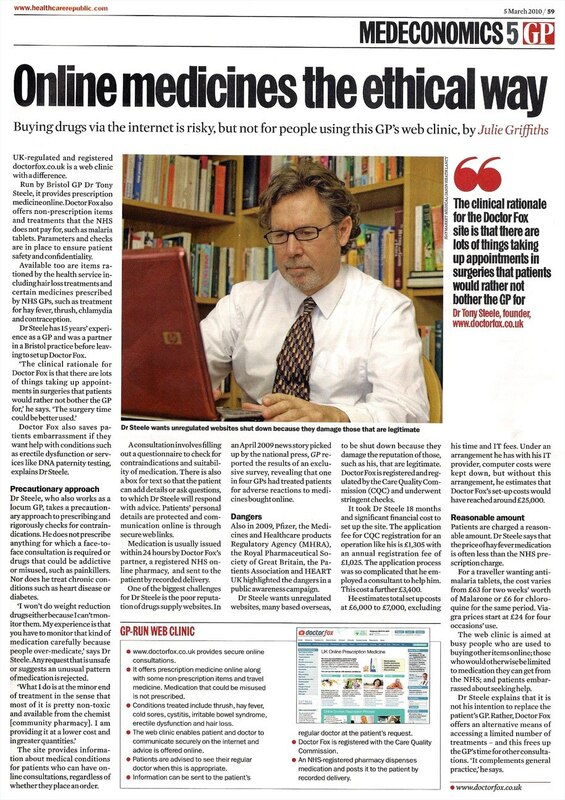 Why are Dr Fox prices lower than other online clinics? Can repeat orders be made? Who are the Dr Fox doctors? Is payment and personal information safe? Is Dr Fox regulated and legal? Can you post outside UK? Does Dr Fox supply medication NOT listed on the website menus? Can I order medication for another person, e.g. my partner, etc? Why can't I order for another person? Can the same medication be ordered more than once at same time? How to set up a new user account? Can a new account use the same email address? Does the payment card need to belong to Dr Fox account holder? Why are orders adding to a previously logged user? Can Dr Fox supply medication for children? Are canceled or declined orders refunded? Can delivery addresses be changed? Can the name or gender (male/female) of an account be changed? Can a delivery be tracked in the post? Is the packaging and billing discreet? How to message the doctors? When a message MUST be sent to the doctors? Why do doctors sometimes message about orders? Has the doctor sent me message? Does Dr Fox deliver to the Channel Islands and Isle of Man? How to order if you already have your own private prescription? Why can't I use Paypal to make payment? Check the registrations of Dr Fox with these agencies. We supply only branded medication from major UK drug companies for trade marked medication including Viagra (Pfizer), Cialis (Eli Lilly), Levitra (Bayer), Champix (Pfizer), Malarone (GlaxoSmithKline GSK) and Propecia (Merck MSD), and others. Dr Fox also offers the choice to order lower cost UK licensed generic versions of some medicines e.g. sildenafil, also known as generic Viagra, and atovaquone/proguanil also known as generic Malarone. We do not substitute lower cost generic versions if branded versions are ordered. Our medication is supplied from UK registered pharmacies, which can be contacted by phone. The medication is not fake. It is the same medication you would get if you walked into a UK high-street chemist with a prescription from your GP. Medication is usually dispatched the day it is ordered or the next working day. It is usually delivered the day after dispatch or the day after that. There is no dispatch on Sat and Sun. Emails with mail tracking numbers are sent at the time orders are dispatched. For more detail see delivery page. We supply only branded medication from major UK drug companies for trade marked medication including Viagra (Pfizer), Cialis (Eli Lilly), Levitra (Bayer), Champix (Eli Lilly), Malarone (GlaxoSmithKline GSK) and Propecia (Merck MSD) and others. We add an amount to the wholesale price of medication which is less than nearly all other online clinics (compare prices). We do not advertise extensively and keep our overheads down. We want people to choose our service on price, but as can be seen from independent customer satisfaction ratings, we are also very good on service. All doctors working for Dr Fox are British, registered with the General Medical Council, and are experienced GPs working in the NHS. The details of the prescribing doctor will be given on each order. Read more about our staff. www.doctorfox.co.uk is 'payment card industry compliant', which means the site is tested regularly for security weaknesses. All data is encrypted before transmission between your browser and the website server. We do not store payment card details on the server. Payment card details go direct to our card processing partner, Secure Trading. We are also accredited by the Trusted Shops scheme. The dispatching pharmacy is always a UK pharmacy registered with the General Pharmaceutical Council. The pharmacy can be phoned on the number on the number on the contact page. Dr Fox is registered with Care Quality Commission 1-101728017. Dr Fox (www.doctorfox.co.uk) is owned by the UK registered company Index Medical Ltd (company no. 6797903 - check details). Yes. Please log-in to your account and select the consultation to repeat and re-order: review previous answers and confirm, then choose treatment required and pay. Every consultation is reviewed by a doctor. No. We deliver only within the United Kingdom. See delivery page for further information..
No. Dr Fox prescribes only treatments listed on the all medications page. No. An online questionnaire must be completed for the doctor. Payment is by card online. No. Each person must have their own account. Questionnaires ask each person ordering to confirm the medication is for their own personal use. We supply medication to named people on prescription. Questionnaires must be completed by the person who is ordering the medicine. This is a safety requirement and a legal requirement. It is possible, however if you do, please send a message to the doctor in your 'My Account' area at the time the duplicate order is placed. Doctors are likely to ask for an explanation about duplicate orders unless the order is for erectile dysfunction medication (Viagra, Cialis or Levitra), where duplicate ordering is routine. Duplicate orders, placed without an explanation, may be declined and refunded. If already logged in, first log out (top right of screen) of existing accounts, then go to Register (top right of screen) to create a new account. A new email address is needed for each new account. New accounts can also be created during the order process after the questionnaire and order screens, however, if a questionnaire was completed when another user was logged in, the order will be linked to that user. If already logged in, log out before the questionnaire to change users. No. Each account requires its own email address. Free email addresses can be set up in minutes at Gmail, Yahoo or Hotmail and many others. No. Payment can be made using a payment card with different details from that of the Dr Fox account holder. The system links the questionnaire answers to the person logged in at the time the questionnaire is completed. If already logged in, you must log out before the questionnaire and register your own account. We are unable to supply medication to under 18s. Orders can be cancelled online in your My Account area up until the doctor approves them, which may be within hours or even a few minutes after the order has been placed. Highlight the order and click 'cancel'. Cancelled orders are automatically refunded within 3-5 working days, possibly sooner. It is possible to cancel an order before it is dispatched by telephoning the pharmacy - see contact page. If you cancel an order or we decline one, a full refund to your card is made. Refunds take 3-5 days. Yes. The delivery address can be changed if you are logged in Details in My Account area. Delivery addresses changed after the doctor has approved a prescription may not update for that order. If you wish to change the address for delivery at this stage you would need to see if this can be arranged with the pharmacy. The telephone number of the pharmacy is on the contact page. Occasionally people change their names or enter the wrong gender by mistake. You cannot change these details yourself - please log in and send a message requesting a change in registration details. Emails are sent to confirm an order has been placed. Further emails are sent when doctors approve or decline an order and another email is sent when the pharmacy dispatch the order. The email confirming the dispatch of the order contains a parcel tracking number. The pharmacy telephone number is on the contact page. Yes. When an item is dispatched an email is sent containing a parcel tracking number. Royal Mail tracking will only provide information once the item has been collected by Royal Mail (last collection 3.30pm weekdays, no collection Saturday, Sunday, or Bank Holidays). Restricted items including aerosols and flammable liquids are sent by APC courier which also provides tracking. You can also, if you are already logged in, view details of your orders, including parcel tracking, in your My Account area. Packaging is discreet and does not indicate contents – a return address is printed on the label. Your bank statement debit will be listed as 'D R Fox'. UK orders normally arrive a day or two after they are dispatched. They are usually dispatched the same or next working day after an order is placed. When an item is dispatched an email with a parcel tracking number is sent. Very occasionally items get delayed or lost in the post. This is unusual. If an item does not arrive in the post 10 days after dispatch, please let us know by email at info@doctorfox.co.uk. We will repost the item or provide a full refund, as you prefer. Registered account account holders who are already logged in can message the doctors at any time. Messages can also be sent for to the doctors at the end of the order process. Doctors usually have enough information to issue a prescription based on your answers to questionnaires. If you make duplicate orders for the same item or are ordering the items repeatedly the doctor will want more information before issuing a prescription. If you do NOT send additional information the doctor may decline and refund your order. The erectile dysfunction medications, Viagra, Cialis and Levitra are an exception, as they are routinely ordered as duplicates and repeats. You may receive an email from the doctor asking you to log into your account (top right of screen) to see and reply to a message the doctor has sent you. Doctors may wish to message you with additional information or may wish you to provide additional information before issuing your prescription. Additional information is sometimes required if orders are placed for the same medication at the same time or too frequently. Has the doctor sent me a message? Advisory emails are sent when doctors send messages. The advisory emails do not contain sensitive details. Yes. Please choose United Kingdom as your country and enter the island name (Jersey, Guernsey, Isle of Man) after the city name when registering. Instructions about how to order with your own private prescription are at the bottom of the prices page. Paypal currently operate a policy of not allowing online pharmacies supplying prescription medicines to have Paypal accounts, so we cannot accept payments by Paypal.